The Lateran Bassilica became the cathedral of the Church of Rome and the seat of the popes for a thousand years..
Summary: Dedication of St John Lateran The Lateran Basilica, the cathedral of the diocese of Rome, was dedicated to Christ the Saviour in the fourth century. The anniversary has been celebrated as a feast of the Latin Church on this date since the twelfth century. It honours the local Church of Rome as a link with earliest Christian tradition and as a sign of our communion in Christ. Although the Pope lives in the Vatican and in the shadow of St Peter’s Basilica, the Basilica of St John Lateran is traditionally the Pope’s church, the cathedral church of the diocese of Rome, where the Bishop of Rome presided in the ‘old days’. The pope is still its bishop. It has as its patrons St John the Evangelist and St John the Baptist. This cathedral is the seat of papal authority and therefore is, in a sense, the parish church of Catholics everywhere. The baptistery is adjacent to the basilica. Since the 7th century it has also been known as the Basilica of the Most Holy Saviour. Patrick Duffy provides some of this brief history. ‘Basilica’ is the word given to an early form of building used for Christian worship. It was modelled on the Roman Basilica – a building used as a law court and a commercial exchange. At first the name ‘basilica’ was used of churches which resembled the Roman building, but now the title of ‘basilica’ is given by the pope to certain privileged churches both in Rome and throughout the world. Pope Sylvester I (314-335) then had the basilica (which literally means a royal hall for transacting business or legal matters) of the house extended and it functioned as a church. 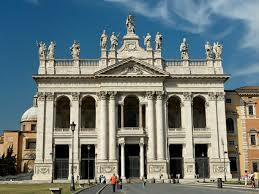 It soon became the cathedral of the Church of Rome and the seat of the popes for a thousand years. It was the residence of the popes until 1308. Ecumenical councils, all called Lateran, were held there: in 1123, 1139, 1179, 1215 and 1512-17. While the popes were absent from Rome in Avignon (1305-1403), the Basilica fell into disrepair. The popes did not return to live there, but resided first at the Basilica of Santa Maria in Trastevere, then at the Basilica of Saint Mary Major, and lastly at the Vatican. The palace was restored by Pope Sixtus V (Felice Peretti 1585-90). Pope Innocent X (Giovanni Battista Pamphili 1644-55) commissioned the present structure of the basilica in 1646 and Pope Clement XII (Lorenzo Corsini 1730-40) gave it a grand new façade in 1735. 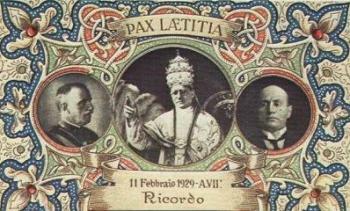 In 1929 the Lateran Treaty was signed in the Lateran Palace by Mussolini and Secretary of State Cardinal Pietro Gasparri. Today the palace houses the Vicariate and offices of the diocese of Rome which Pope John XXIII located there. St. John Lateran is the cathedral of the diocese of Rome where the Bishop of Rome presides, especially on Holy Thursday for the Chrism Mass. One of Rome’s most imposing churches, the Lateran’s towering facade is crowned with 15 colossal statues – Christ, John the Baptist, John the Evangelist and 12 doctors of the Church. 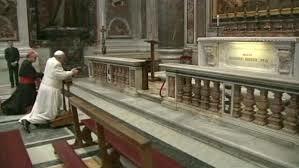 Beneath its high altar rest the remains of the small wooden table on which tradition holds St. Peter himself celebrated Mass. This feast helps us move beyond our narrow geographical confines to a sense of the universal Church. See also 18th November, the Dedication of the Churches of St Peter and St Paul.